David and Bonnie Cantello were addicted to drugs and alcohol for more than 20 years. But everything turned around when the couple arrived in The Salvation Army's Norristown Shelter. With the commitment of the shelter staff and the opportunities for hope The Salvation Army, David and Bonnie turned their life around and feel proud to raise their daughter in the spirit of the hope that Salvation Army offered. Harry Dwier was a cocaine and crack addict for 20 years. He had gone through six drug rehab programs, failing each time. For his sake, he was mistakenly sent to SA's Adult Rehabilitation Center (ARC) in Roxborough. There for six months, he participated in therapy counseling, discovering "how empty his soul was." But thanks to The Salvation Army he turned his life around. When no one else would give him a second, third or fourth chance, Salvation Army did. And now Harry Dwier is Captain Harry Dwier-an ordained Salvation Army minister working with his wife Captain Madelaine Dwier in Ohio. They both formerly served with The Salvation Army in the Greater Philadelphia, Northeast Corps. Ronda is the Metro Philadelphia Regional Music Director. As a child, she participated in the SA music program and Camp Ladore, saying it gave her "something to work toward, and always gave me goals-spiritual and musical." Thanks to the Salvation Army music program, Ronda was able to fulfill a dream to teach music to others. "Every kid that I teach, I see myself-the joys, challenges and struggles I went through." After the loss of his roommate and best friend, Ron Shank was devastated. Being developmentally disabled, Ron was unable to express and deal with his grief. But thanks to the Salvation Army Developmental Disabilities Program, he's back on track. Ron, who is 65, has been part of the DDP since 1987. Previously he had been institutionalized since age 8. Thanks to the Salvation Army, Ron gets the special attention he needs to grow and learn. He is doing much better now and is able "to develop his true talents and abilities,...which he wouldn't have been exposed to in another program. 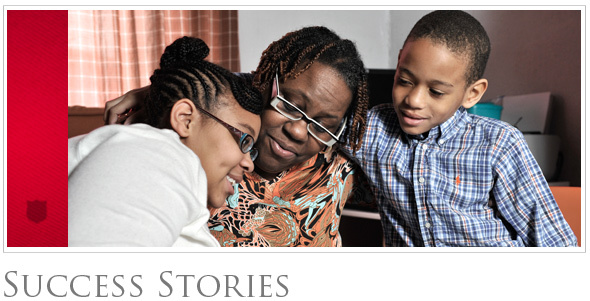 Learn About our Pathway of Hope success stories . . .